A new exhibit, Lunar New Year: Blossoms of Spring will be on view from Thursday, February 8, 2018 to Sunday, March 4, 2018. The Ontario Museum of History & Art is showcasing the Chinese calligraphy and brush painting of the multiethnic group, Sea of Ink Society, in honor of the Lunar New Year, the most important holiday in China – a combination of Thanksgiving, Christmas and New Year’s all rolled into one. The exhibit will be curated by Shantien Tom Chow. The Lunar New Year is the most important traditional Chinese holiday celebrated not only in various Asian countries, but also worldwide. Based on the lunar calendar, the date of the Lunar New Year changes every year and always falls on the second new moon after the winter solstice. Normally, the celebration will start from New Year’s Eve and will last for 15 days until the middle of January. Each year is named for one of the twelve animals in the Chinese zodiac: rat, ox, tiger, rabbit, dragon, snake, horse, sheep, monkey, rooster, dog and pig. For more information about the Lunar New Year: Blossoms of Spring exhibit, please contact the Ontario Museum of History & Art at (909) 395 2510 or visit www.ontarioca.gov/museum. Meet the artists featured in the Lunar New Year exhibit. Light refreshments and hors d’oeuvres will be served. Reservations Required. Free Admission. For more information, call (909) 395‑2510. 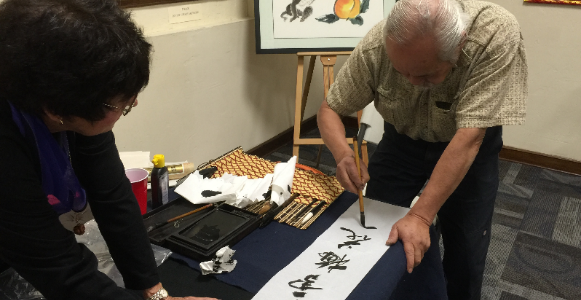 Celebrate the Lunar New Year and the Year of the Dog through a Chinese calligraphy workshop with artist Shantien Tom Chow. All levels and ages are welcome! Materials will be provided. Seating is limited. Two time slots are available. Reservations Required. Free Admission. For more information, call (909) 395-2510. The City of Ontario is Leading The Way in creating urban lifestyle districts that generate sustainable places to live, work, play, and visit. Located just 35 miles east of downtown Los Angeles, the City of Ontario is ideally situated as Southern California’s gateway. With three major interstates, two railroads and the Ontario International Airport, Ontario offers direct access from Los Angeles to the rest of California, and to North America. With approximately 170,000 residents and residential development on the rise, Ontario looks to double its population in the next 20 years, making it one of the 100 most populated Cities in the nation. Complementing its business and residential core, Ontario dazzles with its amenities such as the Ontario Convention Center, Citizens Business Bank Arena, and the Ontario Mills Mall. To learn more about the City of Ontario, visit www.ontarioca.gov or call (909) 395-2000.